SAN DIEGO, CALIFORNIA – February 17, 2016 – DSD Business Systems today announces the acquisition of the Sage 100 Extended Solutions library from SWK Technologies, Inc. The SWK Technologies Extended Solutions are add-ons provided for the Sage 100 accounting and business management system. All of the Extended Solutions acquired by DSD Business Systems will remain available for sales and support. 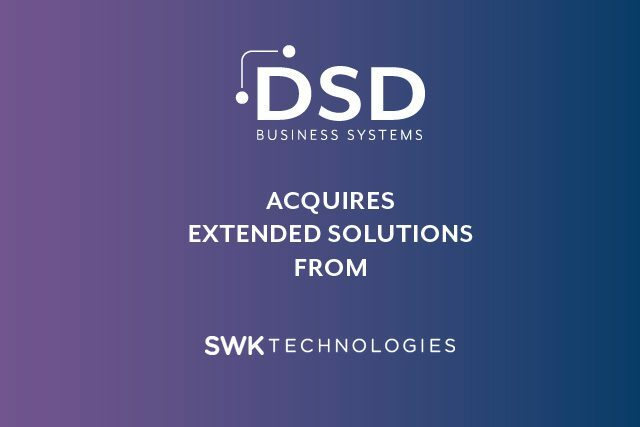 This new acquisition by DSD Business Systems allows these Extended Solutions from SWK Technologies, to continue to be accessed by a broad audience of Sage 100 users. The Sage 100 Extended Solutions included within this library provide additional functionality to the Sage 100 Core, Distribution, and Manufacturing modules. DSD Business Systems will acquire 157 of the top Extended Solutions. DSD Business Systems, a long-time Sage developer and value-added reseller of business management software, has released and maintained over 300 Sage 100 Extended Solutions and will now incorporate these new Extended Solutions into their catalog. Beginning March 1st, 2016, DSD Business Systems will handle all support and sales inquiries for these Sage 100 Extended Solutions. Customers using the Extended Solutions provided by SWK Technologies may continue to use them without interruption. SWK Technologies, Inc., also a Sage business partner and developer, has played an integral part in maintaining the Sage Extended solutions catalog for business partners. “We are very excited to take on the responsibility of maintaining these Sage 100 Extended Solutions for our current and future software users. Working with a trusted partner, such as SWK Technologies, has allowed us to keep these Extended Solutions in the best possible condition for our users,” said Jon Reiter, Chief Software Engineer at DSD Business Systems. “We look forward to continuing our role as the top provider of Sage 100 Extended Solutions”. Reiter is responsible for developing and maintaining Sage 100 Enhancements and Extended Solutions at DSD Business Systems. With the increasing trend of customized software solutions, DSD Business Systems has been able to develop custom solutions that allow Sage 100 to better meet a client’s accounting needs. While maintaining a successful business for over 30 years, DSD Business Systems offers over 400 Enhancements and Extended Solutions for Sage 100. As a Sage Gold Developer and two-time winner of the Sage Gold Development Partner of the Year award, the company also develops custom software solutions for end-users around the world. Founded in 1984, headquartered in San Diego, California, with office locations throughout North America, DSD Business Systems is a national award-winning Enterprise Software Solutions Provider. Serving the needs of small- to medium-sized companies, DSD Business Systems specializes in a service-oriented approach to integrating accounting and business management systems. By automating our customers’ business processes, we help growth-oriented companies turn disconnected data into reliable information. DSD not only implements ERP systems, but as a Sage Gold Development Partner of the Year, DSD has developed widely used product enhancements and custom programming expertise. DSD has been a Sage President’s Circle award winner sixteen times and has been nationally recognized by Accounting Technology Magazine as a Technology Pacesetter and Top 100 VAR firm. For more information, visit www.DSDinc.com.